I’m in the finals, check it out! Yesterday I took a jam making class. When I woke up this morning all I wanted was to open this wonderful new jar of strawberry vanilla jam. Stuff it in French toast sounded like the perfect choice. But being gluten free makes finding good French bread hard. I decided to try and make crepes. They came out great and ended up being pretty healthy too. Check it out. Mix all crepe ingredence together in bowl and let strand for 20 min, stirring halfway in between. It will look very liquid at first but it will set up fine. Heat a small non stick skillet and spray with cooking spray. Lower heat to medium flame. Add about three TBS of batter to skillet and cook for about 2 min or until edges turn golden brown. Gently flip and cook for an additional min. Move crepe to baking sheet to cool. Repeat process with the remainder of batter. Should make about 6-8 crepes depending on pan size. In a separate bowl mix cheese, brown sugar and cinnamon. 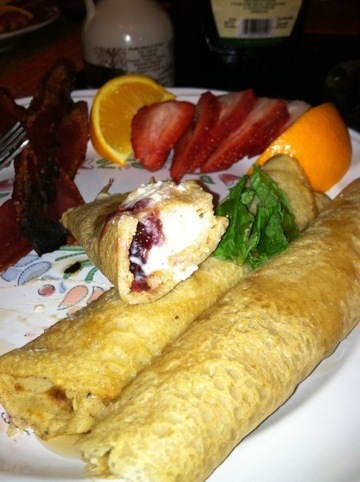 Place a small amount of cheese mixture and jam on the end of each crepe. 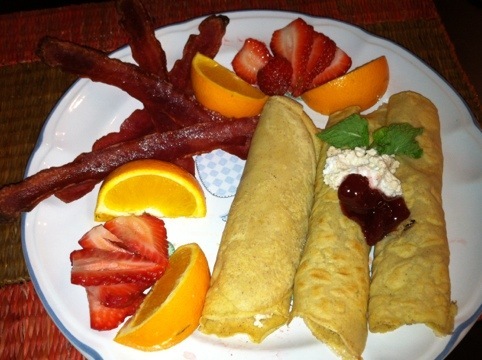 Roll each crepe and place on plate seam down. Serve with syrup and enjoy! The show is really heating up and with the final on the line this week is huge! This week’s challenge is gourmet cooking and nice plating. To keep my trend of international dishes, I chose to go Mediterranean this time. The trick to gourmet cooking is to make it look simple but with flavors that will blow your mind. Mixing textures and colors will make the plate playful and inviting. Give it a try and check out the episode to see how I do! Start by rubbing oil on the peppers and roasting in the oven at 500 degrees. They take about 20 min but watch them so they don’t burn. While the peppers are in the oven the fish can be prepared. In a large bowl, mix together the coriander blend, 1Tsp salt, chick pea flower, garlic and onion powder. Coat only the skin side of the fish in the mixture. Next, place the fish on a hot oiled pan skin side down. Allow the fist to cook for about 3 minutes. As soon as the skin starts to brown, it can be moved to an oiled backing dish. Top each piece with the remaining salt and pepper, and a sprinkle of olive oil. Place lemon rounds along the tops and then finish toping with parsley. Now, it’s time to remove the peppers and turn oven down to 400 degrees. Once the oven cools down a bit place fish in about 5 minutes, again paying attention not to burn it. When the peppers are cool enough to handle, remove the skin and julienne into strips. The fish should be served on top of the peppers either with or with out the skin. I chose to go skinless for the show since it sits a bit before judging and I did not want a soggy final product. 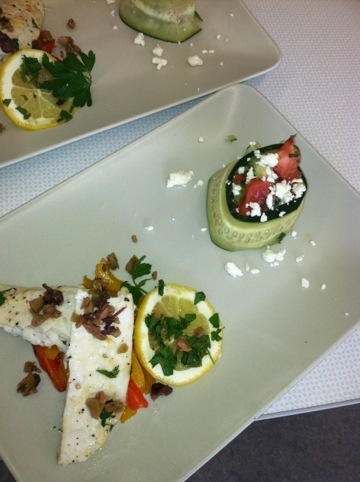 In the show I topped the fish off with a simple tappenade of chopped green olives, red olives, capers and truffle oil. This recipe is a staple at all family meals in my home. Great for any summer day. Place all ingredients in a bowl, stir and let sit of 30 min in the fridge. I prefer to drain off the extra liquid before serving and top with good crumbled feta cheese. NBC 10 Show next local chef: Episode Two! Episode two aired today! The competition is ruff but everyone is a blast to work with. As the weeks go on I feel like I am dreaming. I have found my passion and now its time to show the world what I am made of. The search for the next local TV chef continues. Round Two – cooking on a budget. Each chef was allowed $25 to create a meal for four. Since cooking on a budget is what I am great at, I decided to kick it up a level and pull out all my great stuff. I love to travel and when I need a beach vacation, Mexico is my number one choice. My favorite part is the endless guacamole and the super fresh ceviche. Pair this combo with some black beans and corn tortillas and you have an amazing budget friendly feast that will feed a crowd. Strate by browning onions in EVOO. Next, add beans with 4 cups of water. Then, bring mixture to boil while adding everything except vinegar and bay leaves. Once a nice boil is reached, lower flame to a high simmer and give a good stir. Add bay leaves and vinegar. Let beans cook at least an hour or until the beans reach a soft consistency. If you don’t have an hour, cook the beans before hand for 30 min in boiling water, rinse and then start with the first step. Serve warm and top with Queso Fresco. 1 Cup plum tomatoes seeded and chopped. Ceviche is a dish that is fully cooked without heat. The fish is prepared by soaking in citrus such as lime, lemon or grapefruit juice. It’s important to use very fresh fish in order to make sure the dish is safe to eat and tastes great. In some countries, the “milk” that remains after cooking is considered a hangover remedy but I don’t recommend it. The first step is to marinate fish in lime juice for at least 24 hours (The bigger the pieces, the longer it will take). The fish should be fully covered by the juice so that the meat is evenly cooked. The acid from the citrus will affect any metal it comes in contact with so make sure to use a glass or plastic bowl. After the fish has soaked for 24 hours in the fridge, drain off all remaining liquid. Finally, add sliced peppers, onions, tomatoes, salt, pepper and cilantro. Stir everything gently and serve cold. This dish promises to impress a crowd and is a great option for some inexpensive entertaining. 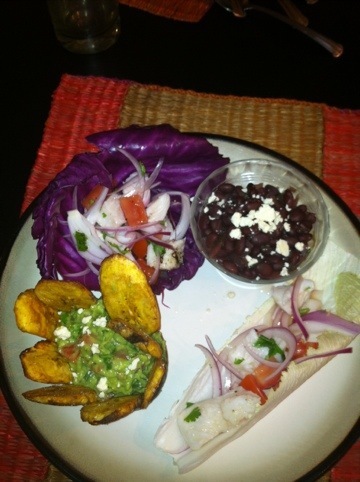 Just serve with tortillas and you have great guilt free fish tacos. You can’t have a Mexican meal without some creamy guacamole and chips. As the guilt free foodie cutie I have added my own twist. Give it a try! Slice avocados in half and remove pit (save both for later). Spoon out the creamy inside and mash with fork in large bowl. Add cilantro, onion, jalapeño, tomatoes and garlic to the bowl. Next, add lime juice slowly until desired consistency is reached. The amount of lime juice depends on how soft the avocados are and prevents avocados from oxidizing and becoming brown but can also make the dip runny if you overdo it. Guacamole is great served in the remaining avocado shells for a nice presentation. Also the pits can be placed in the dip to help preserve freshness when storing in the fridge. Making the chips is easy and a much healthier choice then tortillas. Toss the sliced plantains with oil, sugar and half the salt. Spread evenly on a cookie sheet and bake at 400 degrees for 8 min. Flip chips and sprinkle remaining salt on top. Then return to oven for addition 5 minutes or until they begin to brown and become crispy. As much as I love to cook and share my recipes, I also have a love for eating everything that Philly has to offer. As you have seen from the show, I have traveled them world in search for good eats but I truly believe Philly is home to the best food in the world. From the gourmet restaurants, sandwich shops, markets and trucks, we have it all. Many of my friends know that you can give me an area of the city and a price range and I am sure to give you a great recommendation. At the heart of the city between Catherine Street and Washington Ave. is the Italian Market. This three blocks of paradise is where I live and call home. My weekends are spent hunting for the newest additions and most exotic finds. Once a year, the market hosts a festival that brings in crowds of people to tastes sauces, sandwiches, cheese and best of all the cannoli. For years, I have always planned my route and made sure to get my favorites early. This year it’s a little different, my recent gluten intolerance diagnosis makes my splurging at little harder. Luckily, Philly is always quickly adapting to new trends and when it comes to food, more places adapt to any diet. The Italian Market has made many changes this year and for a gluten free foodie it’s a dream come true. This includes great new restaurants that cater to gluten free dishes like Monsum which has the best brunch in the city, never a line and always BYOB. They will adjust almost any dish to be gluten free, even the pasta and gnocchi. 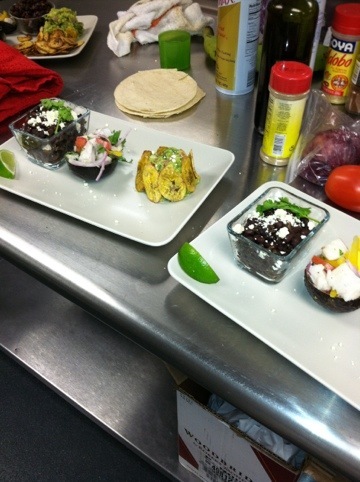 Chef McAndrew is a master at everything he does and he is sure to be attracting a large following. Not only is his brunch and dinner a must try but he has also opened a few sandwich shops in the city that can’t be missed. 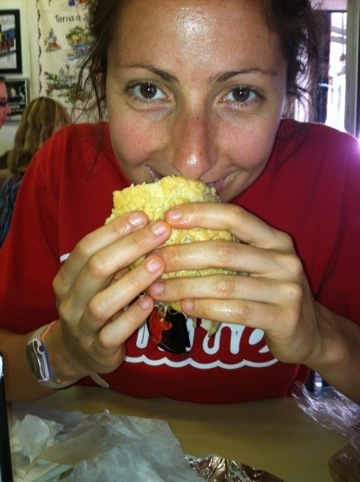 If you come to the City of Brotherly Love for a real cheese steak from Pat’s or Geno’s, think again! Paesano’s I and II are the real Philly experience from the classic Italian hoagie, spicy chicken or my favorite – the lamb sausage. The juicy meat and outstanding combo of flavors will leave you wanting to try it all. Best of all, they make everything gluten free by request. That’s right, gluten free hoagie rolls. Truly something almost impossible to find anywhere! The bread they use comes from a great little shop across the way in the market. It’s called Taffet (originally TOTE). 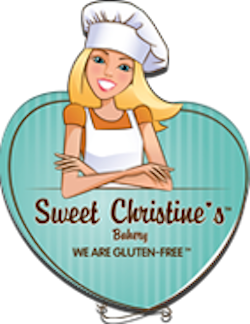 They make gluten free pizza dough, cupcakes, cannoli, various breads, cookies and are always open to new ideas. The smells of the freshly baked goodies from this shop in the market will pull you in looking for a treat. 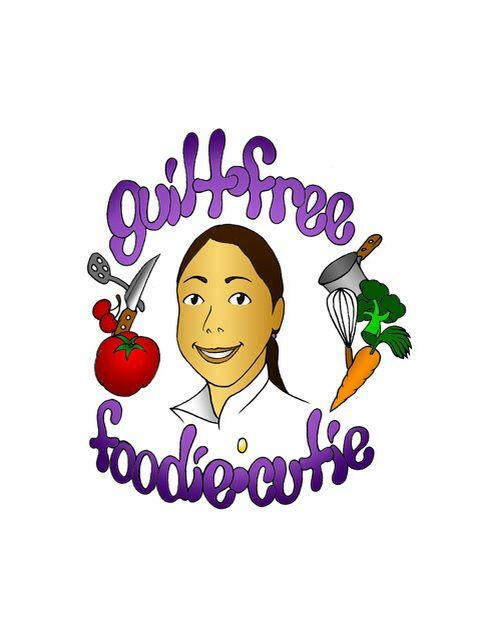 Taffets’ success alone proves that gluten free options are not just a trend but are here to stay. These places I mentioned are only what’s in the Italian Market. Overall, Philly has a gluten free lifestyle that is continuing to expand rapidly. 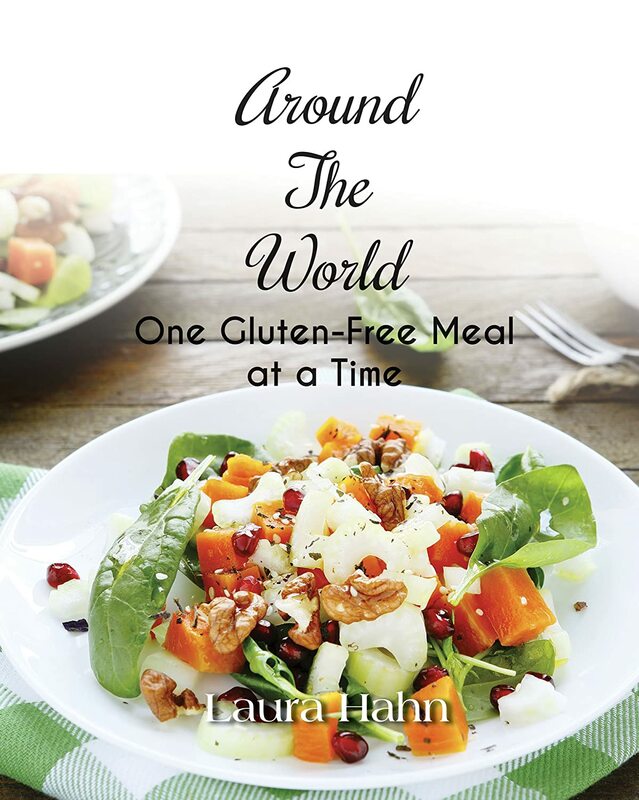 I live to try it all and promise to make the Guilt Free Foodie Cutie not only a source for recipes but a place to follow my gluten free adventures. If you have a place or product I should try, please let me know! The first show went great!!! It aired this week while we filmed episode two. The whole experience is surreal. I feel like having a camera in my face while cooking is a dream come true. I fall asleep watching cooking shows and now I am actually in one. I was excited for just one show, thinking that what I make would not even compare to what everyone else would do. I just did not want to make a fool out of myself. I got on set and was scared when I saw how prepared everyone was. Here is this 25 years old walking in with a box of rice paper, carrots and some peanut butter. Once I started cooking it just went smooth. I may have needed some help with turning on the oven but watching a hundred episodes of Chopped paid off. I was running around looking for spoons and different size bowls. Hoping that my first time using a convection oven would not be a disaster. Then with two minutes remaining to plate my heart was racing. When we went to judging I was really surprised by how much the chefs enjoyed my meal. Stay tuned for next week!!!! Good gluten free snacks are not easy to find but this quick recipe will knock your socks off. I love playing with rice krispie recipes but this one takes the cake. As always, feel free to change it up and add any type of nuts or dried fruit your may have on hand. In a large pot slowly melt the butter and add marshmallows. Keep the flame low and watch the mixture melt carefully. Once it is completely melted turn the flame off. Add half the rice and stir to coat. 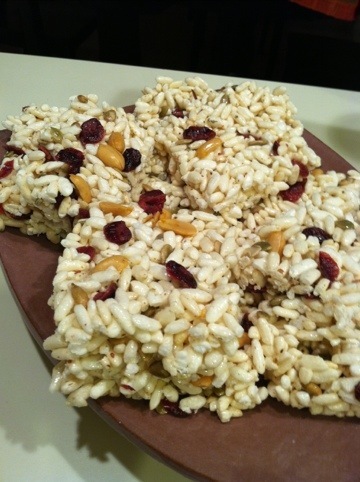 Add the the topping and the rest of the puffed rice and continue to stir slowly until everything is evenly coated. Be careful not to crush the rice while stirring. Spray a 9″ by 12″ high sided baking tray. Pour the mixture in and press it down evenly. Let the mixture firm up at room temp for an hour and then cut into squares. The first episode aired!!! Check out the clip.